White Sox Cards has officially entered the fray, as I received a spectacular package from him on Saturday (That's what she said). The highlight was a 1956 Topps Tom Gorman, plus a boat load of Padres, of which I only had one. I must say he raised the bar for me, and I will have to go digging into the treasure chest for another trade round. Kudos my good man. Anyways, the tourney is well under way. The Astros are all but dead in the water facing a 5 game up hill battle against the dreaded Giants. And if it couldn't look worse for Do-ho fans, you're down one game to the Nats. Ouch. I received some flak about the Phils being the #2 seed, but as stated previously, the seeding is based on 2009 regular season standings. If you want in on the fun, all you need to do is complete a trade with me and your entered to win a prize. I'm still debating on a prize, but it will likely end up being a 600 count box of your favorite team (junk wax not withstanding). Any more Musial cards? Nope, just the one in the Gallery. This is a great idea. 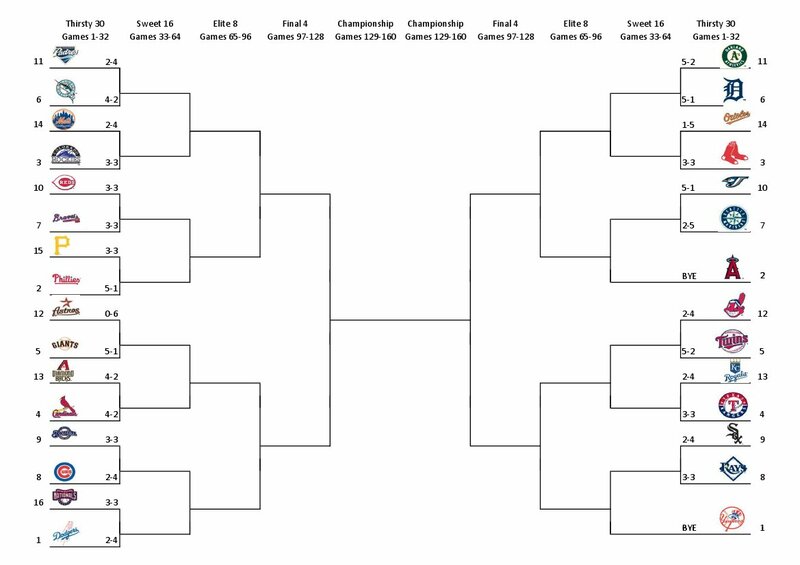 Way better than the NCAA 96 game bracket you'll be seeing next year.